In 1913 J. A. Robblee & Company was founded by James A. Robblee for $40.00. It was first located in the Lincoln Business District at south 38th and Park Avenue. James and his brothers worked hard at selling and repairing bicycles along with selling wheels and other items for a new invention- the automobile. In 1918, William A. Robblee joined his brothers and brought with him the skills of locksmithing. William was kept busy handling the safe and lock work and also taught some of his brothers his skills as business increased. 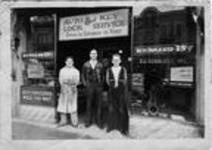 Early in 1920, the company moved to downtown Tacoma where their commercial clientele were located. Over the years, the business relocated several times and continued to prosper and grow. In 1930, James died and the remaining brothers incorporated and renamed the company Six Robblee's, Inc.
After World War II, the younger brothers still working at Six Robblee's wanted to expand into other areas and discontinue the safe and lock work. In 1947, William Robblee wished to retire but wanted to see the safe and lock work continue as he had worked so hard to promote that entity of the business. He encouraged his son, William H. (Bill) Robblee and his son-in-law, Thomas H. (Pat) Patterson to buy out the Safe and Lock Division of Six Robblee's, Inc. from the corporation. They did this and renamed the new company Robblee's Safe and Lock Company. They remained in the present location and Six Robblee's again relocated. In 1962, Robblee's Safe & Lock Company was expanding and growing and needed more room. The Company was moved to the comer of 9th and Pacific Avenue. The store was years ahead of what most typical locksmith stores looked like at that time. Ten years later in 1972, Pat Patterson died and Bill Robblee became the sole owner. In 1975, Bill wished to retire and sold the business to Pat's son who was employed at the store. John W. Patterson purchased the business and became a third generation owner of the company. Soon after purchasing the business, John incorporated the Company and it was renamed Robblee's Safe & Lock, Inc. In 1980, the Corporation was moved to its present location at 751 Tacoma Avenue South. In 1997, the Corporation reorganized with three Divisions devoted to meeting changing market place needs: Access Control Systems, Contract Hardware and Professional Locksmithing. At the same time, the name was formally changed to Robblee's Total Security, Inc. and the Retail/Wholesale Showroom modernized to recognize those changes. In 1988, Robblee’s listened to our loyal customer base and branched into the unknown technology of electric card access and CCTV camera systems. The need for this revolutionary advancement in security was in its early stages. Robblee’s adapted to this ever changing industry with the same passion as we did in the locksmith industry. We were tasked with designing and deploying the latest technology to meet our customer demand. Changing from a mechanical security company to an electronic security company didn’t take place overnite. In 1992, we created our access control division within our company. This was a dedicated team of forward thinking professionals that pioneered this branch of Robblee’s. Over the next few years, we were tasked with re branding Robblee’s so that our clients were familiar with all of our offerings. In 1993, John Patterson’s oldest son Jim came to work for the company, thus starting the 4th generation. Jim started out as a locksmith and in 1994 he moved into a new position as an electronics apprentice then Journeyman electrician and electrical administrator. In 2000, Jim became the company Vice President with an emphasis in electronic security. Jim’s brother John started in 2004 after graduating college. John became a journeyman electrician and project manager. In 2014 John Patterson retired after nearly 45 years with Robblees. His son John became Vice President and transitioned from the field to our senior sales lead for electronics. Jim Patterson became president in 2014. Robblee's is grateful for the many talented employees and long-term customers who, over the years, have contributed to the success of Robblee's as a company today.